This is a collection of songs that are all linked in one way or another to my family members and to the place I was brought up, East Wall, Dublin. When I was born my parents lived in a rented downstairs room on Fairfield Avenue and this is where I spent the first year of my life. They then moved to a house around the corner on the West Road, beside McArthur’s ‘wee’ shop. 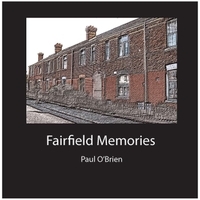 As a child I played on the Fairfield football team in the local street leagues and many of my school pals lived there, it was also part of my paper round. I was fascinated by the first twenty ‘apartments’ or flats on the avenue, small and very unusual for the area, indeed for Dublin. They are known locally as the ‘Scotch Buildings’. These apartments were built at the beginning of the twentieth century to house Scottish immigrant workers who came to work in the Dublin shipyards, though I was not aware of that then. I felt, and still feel, an attraction to this part of the street perhaps simply because it is so unique and in a way represents my childhood. I visit the avenue regularly to wallow in the memories of the boy I was when that area between the railway and the sea was my whole world. This is a collection of songs that are linked to this area and to my family members. Some I wrote many years ago, some more recently. All of them are based in one way or another on the feeling I get whenever I walk along Fairfield Avenue. The older songs are songs that I have not previously recorded but I had regularly played with my brother Gerry, who passed away in 2013. I felt it was time to make them available to all.